Anderson Silva defeated Nick Diaz over the course of five rounds as he returned to the Octagon at UFC 183 in Las Vegas. The Brazilian, ruled out for more than a year after suffering a horrific broken leg injury, managed to keep the tenacious mind games of Nick Diaz at bay in the opening parts of the fight. And, when he got comfortable, business really picked up. An emotional Silva post-fight would go on to leave some doubt about his future, but no doubt in the fact he could still mix it up with the best mixed martial artists on the planet. Earlier in the night, Tyron Woodley handed Kelvin Gastelum his first defeat, and Al Iaquinta was ruthless in dispatching Joe Lauzon. Thiago Santos got the proceedings off to a flyer, pummeling Andy Enz in the first round. A hard body kick dropped his opponent before merciless ground-and-pound to get the win. Ildemar Alcantara edged Richardson Moreira in a split-decision victory before the prelims took to television. And when they did, we were in for some fantastic action. Rafael Natal dominated Tom Watson before the Flyweights went at it in an enthralling bout between John Lineker and Ian McCall. The two went at it viciously and Lineker got the points win. Derek Brunson then tore through Ed Herman in just over 30 seconds. Miesha Tate picked up a big win in the Women's Bantamweight Divison as she topped Sara McMann in a brilliant contest. "Cupcake" was torn apart in the first-round, but managed to weather the storm and put things back in her favour over the last two rounds. Thiago Alves overcame a troublesome first round to impressively finish Jordan Mein with a body-kick in the second round. The youngster Jordan Mein came out swinging for the first round, and had Alves on the verge of a finish as the first round began to wind down, throwing a barrage of heavy punches and standing elbows that had the Brazilian out of sorts. After a pulsating first 5 minutes, Thiago Alves would need no reminder to finish it all with the first opening he could find. As Jordan Mein left his ribs exposed, Alves landed a heavy body kick sending his opponent crashing to that mat and finishing the fight. Excruciating: Mein winces in pain following the body-kick. Submission (Arm Triangle Choke), 3:45, Round 2. An arm-triangle choke executed to perfection would see Thales Leites top the 'Barbarian' Tim Boetsch in a compelling middleweight tilt. 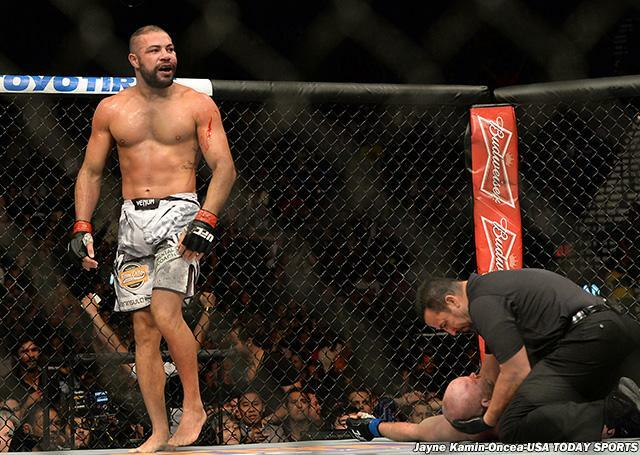 Battling it out in the centre of the octagon, they traded wildly from the outset, but soon it became clear that Leites' plan was to get him to the ground. In round 2, we would find out exactly why. Tim Boetsch managed to get out of the first arm-triangle, but seconds later, he found himself in further trouble which put him to sleep. Al Iaquinta composedly put Joe Lauzon away in a gripping lightweight fight as he put the Boston man away after a second-round barrage. With both trading wildly, Joe Lauzon almost found a lock with the guillotine choke, but to no avail and the fight would go on to a second round. In that round, a huge right hand wobbled Joe Lauzon, and from then on in, the writing was on the wall. Lauzon was stumbling around the octagon and his balance was gone, it was target practice for Iaquinta. Lauzon's toughness would not come into question as the referee stopped it wisely before it could get any worse. A resounding win for "Raging" Al Iaquinta. 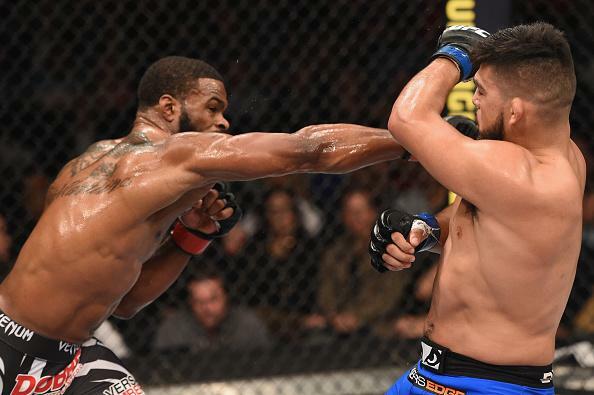 Tyron Woodley edged Kelvin Gastelum in an uneventful contest. A positive first round was edged in the favour of the TUF winner, but when Woodley began to land his shots, things went his way. With little action though, it took a split decision to determine the outcome. Anderson Silva made his highly-anticipated return to the UFC octagon and, in convincing fashion, he out-classed Nick Diaz in an entertaining main event. Diaz, fighting a division above the usual, employed some mind games to get into the head of the "Spider", even at one point lying down and urging Silva to fight. However, Anderson remained disciplined and focused at the task at hand. 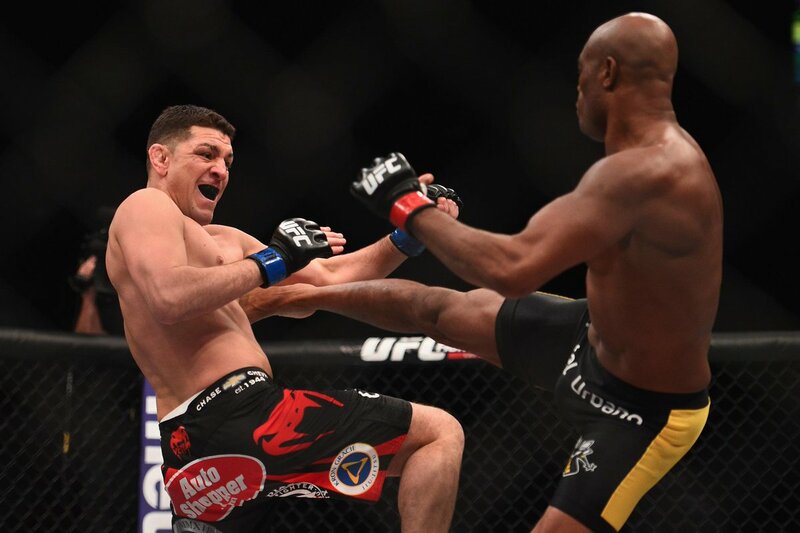 As the fight went on, Silva began to use the left leg of which he broke in his last fight in December 2013. Nick Diaz was getting busted up, but Silva wasn't, even with the taunting Diaz landing a variety of shots. We saw a lot of leg kicks used by Nick Diaz too, but the Brazilian seemed unfazed as he continued to go forward. By the third round, it was Silva's to lose, but he stayed on task and went on to win. At the announcement he won, Anderson Silva fell to the ground and cried, symbolic of the journey he had made back from what could have been a career-ending injury. After an embrace with Nick Diaz, emotions continued to run high. Anderson Silva proved he is still an elite, the Spider has risen. It's good to see the greatest fighter on the planet get back at it. Anderson Silva makes his anticipated return from injury battling Nick Diaz at UFC 183 in an emotionally charged night in Vegas.